I am admittedly a gear head and I love cycling products nearly as much as I love riding. In all the product-based aspects of my life, I’ve been an early adopter—my house had automated locks and thermostats long before HomeKit or AlexaHome could control devices; I wrote reviews of WiFi routers back when it was necessary to explain what WiFi was, I used large, bulky GPS units for a cycling computer years before a streamlined cycle-specific model would come to market. In the last few decades I’ve put tens-of-thousands of miles onto Shimano, SRAM and (to a much lesser extent as I never got used to the the paddles) Campy, and the last thirty miles of riding on Di2 have instantly become some of my favorite. I put on a few hundred miles on that Electronic, Bamboo bike, before a foot injury and a newborn convinced me to sell it to someone who would go out and ride it while I was spending a few years recovering from surgery. It wasn’t my only bike, and I was sad to see Di2 go, but I was also enjoying the few rides I could take on a bike with SRAM Red on it. Even in the first few miles I have a few areas where I’d like to see additional tweaks. The most obvious would be to have a press-and-hold action on a shifter move the rear derailleur through the cassette as long as the button is being depressed. This seems like a simple electronic tweak that would eliminate the criticism that multiple presses are required for multiple shifts. I’d also like to see some sort of user-based control of the shift buttons. There’s no real reason why one has to stick with the assigned “front is easier rear is harder” setup, and in fact I find that I have to retrain my mind when switching from SRAM to Di2 as to which button does what. It’s led to a few awkward fumble-at-stoplight moments so far. With Shimano’s newly-programmable Di2 system, it’s possible to do an incredible amount of adjustment and custom tweaking, including letting the bike pick a gear for you. It’s exactly the sort of customization I was hoping for with the original system. While getting back into riding, I sort of fell in love again with mechanical shifting. While it was always very loud, SRAM Red grew up very nicely, and the most recent version shifts incredibly well, albeit a bit noisily. There’s something harmonious about pulling a lever and feeling the mechanical pull of cables beneath your hand. But there’s also cable slippage and stretching as well as contamination to the housings on dirt-filled rides, which results in missed shifts and occasionally tweaking of the components. These are the things that made me interested in Di2 in the first place. When SRAM released their eTAP wireless electronic system, I had an instant desire to refit my bike with the new components. I wasn’t at first sold on the “odd” shifting system, which seemed a bit complex, and largely designed to avoid patent lawsuits, but a few test rides cured me of that. The reduction of wires from my frame was a large motivator for me to try eTAP, and the weight penalty for eTAP over Red was marginal. I would have jumped on board instantly but the eTAP derailleur didn’t come in a WiFLi long cage version which worked with my cassette. With the introduction of that component I was ready to jump to SRAM eTAP and see how the world of electronic shifting was doing. It turns out, it’s doing very well. As many reviews have pointed out, electronic shifting just works. There’s almost never a mis-shift, it’s possible to shift under load, and the battery life is more than enough to be able to forget charging for long periods of time. eTAP works as well as Di2, which is important in that the components aren’t connected by wires and that seems like a weakness, when it comes to reliability of shifting. We’ve all had enough problems with cell phone calls and flaky WiFi hotspots that it seems like wireless shifting should be full of problems, but it’s not. Shifts work, every time. I do wish that SRAM had the bevy of customization options that Di2 has, I want to be able to swap the up and downshift buttons, for example, because I don’t race and I ride in suburban traffic. It’s more important to me to grab an easier gear than a harder gear, and my right hand is my dominant one. Right now I have to use my left hand to shift enough to not be in a bad gear choice as the light changes and I get back up to speed, and that’s not a natural feeling for me. I’m not sure I’d use the various Di2 modes for changing how the bike shifts—combining front and rear derailleur movements in order to maintain gear ratios—but I’d sure like to play with them. An eTAP feature I’ve come to love is the remote-mountable “blips”, small shift buttons that can be put anywhere on the cockpit. I’ve placed Blips on my bars tops, near the stem, and can use them to shift when I’m riding off the hoods, and that’s been fantastic. Being able to shift without having to move your hands from a riding position is a mental change that’s hard to remember, but once my body developed muscle memory for the location of the blips, it became second-nature. The next set of Blips were the 150mm length, and those are a bit short. There are also 450mm and 650mm lengths for aero bars.) It’s like the Goldilocks of bike setup. It would be great to have blips in 30mm or 50mm increments. My bars are carbon, and are shaped, so the Blip housings the company sells to attach them on the bars without putting them under the handlebar tape only really fit right near the stem, where the bars become round again, but there’s not enough cable length to reach there. The location I ended up using is right at the edge of my bar tape, and they look a bit like my bike handlebars have a tumor. It’s not a tumor. I should have done a test ride with no tape, as I’m going to want to move them a few mm over and forwards, but I should be able to re-wrap without much issue. After dealing with the installation issues I went for a few rides and the Blips work incredibly well, even taped. I can shift with my hands on the bars, I can shift on the hoods, and if I wanted to install some on my drops, I could shift there too, as it’s possible to install two pairs of Blips per lever. The Blips are, frankly, the killer feature of eTAP for me, and they’re something I fantasized about on multi-day charity rides I used to do, as I tried to keep shifting my hand position to keep from getting sore. When my hands were on the tops of my bars or on the drops, I’d always worry about having to panic-reach for the shift levers if I needed them. I’d also have killed to have a wireless shifting system when I used to travel with my S&S-coupling converted bike in a hard case. Every place I showed up to ride I’d have to methodically reconnect cables from quick-release ends and tune my derailleurs. Having a bike with no shift cables would have saved me hours of time assembling and disassembling the bike. I’m hoping that SRAM adds some features to the system that lets users customize it. On their FAQ the company has this question: “Is RED eTap software or firmware open source? 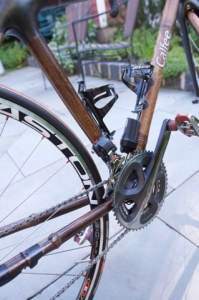 Can I get into the code and tweak it to make it work with 10-speed or change the shift speed at different points in the rear derailleur’s sweep?” The answer is short, “No. It is a closed system. The RED eTap is not programmable.” In fact the SRAM eTAP FAQ humorously answers “no” to nearly every question about the advanced functionality of the shifting system. Is it open source? No. Can I tweak it? No. Can I set up the system to do sequential shifting? No. Does SRAM make a compatible head unit? No. Can Quarq power meter data be combined with gear selection data? No. The very existence of such a lengthy question about very specific functionality on an FAQ says to me that they’re thinking of future functionality, but also trying to reduce the buyer’s remorse of someone that’s shopped Shimano and is looking at eTAP. The question though is what happens to the SRAM eTAP wireless advantage when Shimano goes wireless, as it eventually must? Does SRAM roll out a firmware update, or a whole new group? Or does SRAM leave their system with the basic, predictable functionality they designed it with and leave Shimano to capture the software-tweaking market. Personally I hope they update the system, as personalizing the functionality seems a fundamental function of going electric. If we wanted to just be able to push one thing to shift up and one thing to shift down, and then not adjust the functionality, we could stay with mechanical systems. All of the new electronic groups represent a big change in how bicycle design and bicycle operation are handled, and they’re going to become a more frequent sight on the roads and trails. But their time has definitely arrived.